Every job must be created under an environment. Each job must have a unique name. Two jobs cannot have the same name, even if they appear in two different environments, because all the jobs are in the same folder on the server. 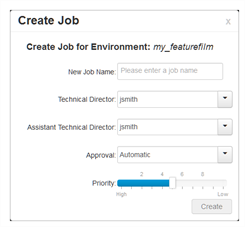 From the Environment list, select the project in which you want to create a job. The Create Job window opens. In the New Job Name field, enter the name of the job to create. NOTEThe job name is alphanumeric and can include underscores (_), but no spaces or other special characters. The job name is case-sensitive. From the Technical Director list, select a technical director (TD). The names available are generated from a list of all possible users by their login username. You must select a TD to create the job. A TD is usually the person who oversees the animation project and makes sure the work is done properly. Select the person who most closely resembles this definition. If you do not have a particular user for the task, you can simply assign this field to: BATCH. When creating Harmony users, you can label a user as a TD. From the Assistant Technical Director list, select an assistant technical director (ATD). The names available are generated from a list of all possible users by their login username. You must select an ATD to create the job. If you do not have an ATD, select the same person for the TD and ATD jobs. In some studios, the responsibilities of the TD can be shared by more than one person. This second person is the ATD. From the Approval list, select how Harmony will mark the various stages that the scenes will pass through in your production schedule. Automatic: When you work on scenes, Harmony automatically approves their status at each stage. Manual: When you work on scenes, the TD or ATD must approve their status at each stage using the Change Status command in the Scene menu. Adjust the Priority slider to increase or decrease the job's priority (0 means the job has the highest priority for processing through the Vectorize or Render queue, and a job with a priority of 10 is the least important). Jobs with higher priorities pass in front of other projects with lower priorities in the rendering and vectorizing queues. If you do not know what priority to assign to your project, leave it at 5. You can always change it later. WebCC adds the new job to the selected environment; it appears in alphabetical order in the Jobs list.